Hawaii BBS is a real Atari 8 Bit BBS from the 80s. I am using Oasis 4.7 from Z-Innovators (c) 1989. Following Emulations are supported: Atari AtascII, Atari ST Graphic, C-64/128, Ansi and AscII. Connect to Hawaii BBS Atari 8 Bit Now! 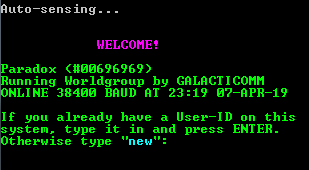 This BBS is using a non-standard telnet port (8888), the web telnet script may not work.